Welcome to LegalEase: a monthly Montreal-based and produced radio show on 90.3 FM CKUT, broadcasting the law cast broadly. This episode is entitled, Case Study: The Oka Crisis at 20 years . You can access the show by clicking here. 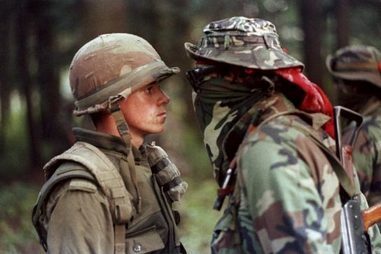 What is the Oka crisis? Check wikipedia:http://en.wikipedia.org/wiki/Oka_Crisis Host Melanie Benard directs this reflection of our collective legal consciousness. First, Olympian and director of the First People’s House at McGill Waneek Horn-Miller shares a recollection of the Oka crisis. Horn-Miller spent a month and a half within the barricade and discusses the experience with the LegalEase collective. Next, we go back to 1990 and play some CKUT archival footage from the Oka Crisis. This portion includes music and interviews. Third, we hear from acclaimed NFB filmmaker Alanis Obomsawin, the director of Kanehsatake: 270 Years of Resistance. These audio clips were recorded in June, 2010 at her presentation at the Revisioning the Americas through Indigenous Cinema conference, which was organized by the GIRA. Kanehsatake: 270 Years of Resistance is available online You can watch the entire film here. Finally, we turn to Kahnawake and the Whiskey Point incident. In 1990, residents of a nearby reserve decided to leave, fearing reprisals by neighbouring communities. While leaving, thousands of residents from Chateaguay and surrounding areas attacked cars carrying Mohawk families fleeing the reservation.